Frames are produced from 6063 marine grade aluminum and can be bent on 2" or 3" opening radius or made with mitered corners, and can be finished clear or black anodized. Louver blades are installed in a frame on stacked 0.75" square tube sections which can be spaced between 3/4" and 1.25" apart.This construction eliminates blade vibration and decreases air flow restriction and pressure loss. 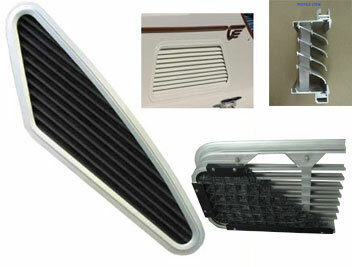 Angle of louver blades is 35 degrees from horizontal but can be adjusted according to customers preference. Frame depth can be reduced whilst maintaining structural integrity, to increase flow in upper and lower sections of air intakes. This is of particular interest when overall height or void behind AI is limited. Demister pads can be installed capable of eliminating 98% of all salt/water particles up to 200 micron, whilst maintaining air flow at aprox 97% of original volumes. AI's can be installed with a clamp system, similar to clamp system used in Bomon windows, if accessible from inside, or can be fastened from the outside.